"There is a right way and a wrong way to summon her. This creepy ghoulish series takes on the tale of Bloody Mary, and drives the legend even further than before. A few friends hanging around a bathroom, trying to summon a ghost, huh? What could possibly go wrong? I’m so in love with this plot, even if it scared the daylights out of me! The concept of four friends summoning a corpse ghost and then to be viciously haunted by it is simple yet terrifying. It may start off reading a bit middle-grade at first, but as it progresses, it really gets into a good, more mature, groove. 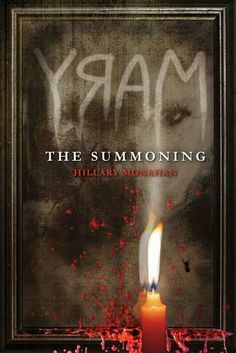 Although the characterization initially lacked on the evocative side, the author does a grand job of setting the scene and putting Mary before us in all her ghoulish glory. It’s the great descriptions or Mary and her methods of haunting and killing that really held my attention, as well as the mystery of how she got that way. How will they ever keep Mary from reaping more havoc when she slithers out just about everywhere at anytime? Mary doesn’t just appear in mirrors anymore, oh no, that’s old school. Now it’s anything with a shiny surface; TV screens, windows, cars, doorknobs, you name it. Look around and think of how many places Mary could be lurking and stalking you right now. Are you scared yet? Shauna and her friends go through a real test of friendship as they suffer through this terror. This alone will have the reader’s emotions flying back and forth. More than a few times, I personally wanted to reach into the book and slap one of them *cough* Jess *cough* haha! I seriously need to find out what will happen with Mary and the haunted crew so you can bet I’ll be waiting anxiously for the sequel! If you like horror, suspense, and a good historical mystery, this book is definitely up your alley.